During the course of prenatal care, the physicians of Alliance Ob/Gyn will perform sonograms to evaluate the progression of your pregnancy. Both offices are equipped with the latest, and in our opinion, the best ultrasound equipment available, the GE Voluson 730. This is the premier 3D/4D machine available in the United States. We feel that all of these sonograms are medically necessary. Insurance companies do not. You are not responsible for the payment of any sonogram that is not covered by your insurance company; however, if there is a co-pay or co-insurance associated with your sonogram, you will be responsible for those. Routine sonograms are included for our private pay (uninsured) patients. It will confirm your due date. The first trimester sonogram is much more accurate than later sonograms. It is very reassuring that the pregnancy is progressing as it should. Unfortunately, in any pregnancy there is a 15%-20% chance of miscarriage, but after a normal heart beat is seen that chance is reduced to 3-4%. A normal heart beat is usually seen between five weeks and six days and six weeks and two days. If a heart beat is not seen, we like to see you weekly until a viable pregnancy is confirmed. 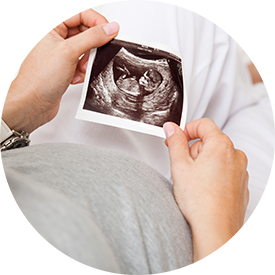 At 32 weeks a sonogram is performed to evaluate fetal growth as well as the placenta and amniotic fluid. This third trimester scan is above what is considered standard of care in the United States. We are generally not paid for it, but feel it is important.